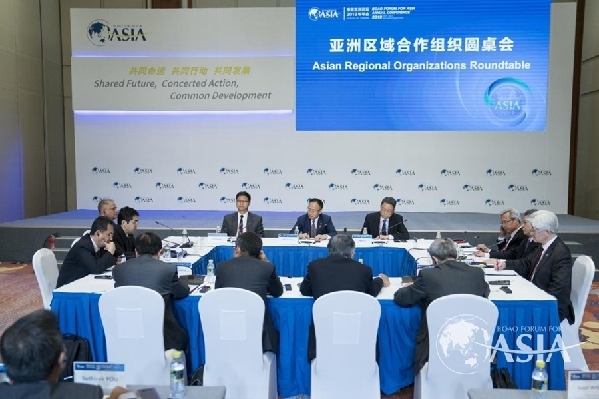 On 28 March 2019, the Round-table on Asian Regional Cooperation Organizations was held during the Boao Forum for Asia（hereinafter referred to as BFA）Annual Conference 2019. Mr. Chen Xiaodong, Assistant Foreign Minister of China, attended and delivered a keynote speech. Mr. Chen Dehai, Secretary-General of the ASEAN-China Centre(ACC), attended the round-table and delivered remarks, together with Mr. Aladdin D. Rillo, Deputy Secretary-General of ASEAN Secretariat, Mr. Amjad Hussain B. Sial, Secretary-General of South Asian Association for Regional Cooperation (SAARC), Mr. Lee Jong-heon, Secretary-General of Trilateral Cooperation Secretariat (TCS), Mr. Bundit Limschoon, Secretary-General of Asia Cooperation Dialogue (ACD), Mr. Nurlan Akkoshkarov, Deputy Secretary-General of Shanghai Cooperation Organization (SCO), as well as other heads of international organizations and scholars of regional studies. Assistant Foreign Minister Chen Xiaodong reviewed the significant achievements of Asian regional cooperation on promoting multilateralism, defending free trade, and advancing sustainable development in recent years. He stressed that the Chinese side hopes to work together with other Asian countries and regional organizations for a closer Asian community of a shared future by promoting in-depth alignment of development strategies, high-quality development of BRI cooperation and regional economic integration. He also made three proposals on improving regional cooperation in Asia. The first is to make new achievements by improving regional free trade architecture in order to draw a blueprint for East Asia Economic Community and to provide guidance for future regional cooperation. The second is to add new driving forces by deepening cooperation in connectivity, poverty alleviation, education and security so as to promote sustainable development in Asia. The third is to open up new prospects by accelerating innovation-oriented development and promoting cooperation in 5G network, smart city, artificial intelligence, big data, cloud computing, and Internet of Things to create new technologies, build new industries, and reach new heights. Deputy Secretary-General Aladdin D. Rillo mentioned in his remarks that regional cooperation has served Asia quite well over the years, particularly in restoring economic growth and maintaining financial stability. He stressed on the important role of regional organizationsin the effectiveness and sustainability of regional cooperation. Under the current situation, countries of the region should reinforce their commitments to cooperate with each other. The first is to identify and prioritize those areas of cooperation with great impact on the region. The second is to establish effective mechanisms to implement relevant regional cooperation initiatives. The third is to strengthen policy communication to ensure the successful implementation of regional cooperation initiatives. 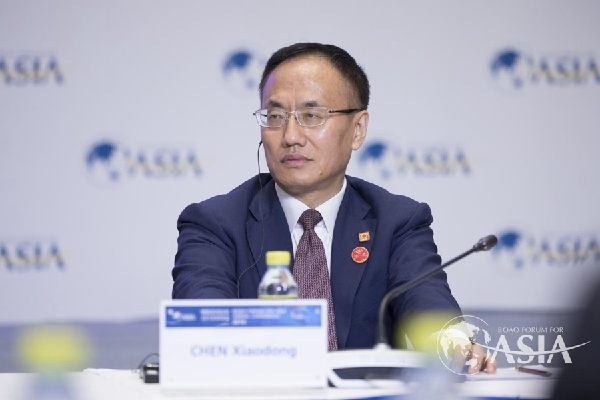 Secretary-General Chen Dehai stated that Asian regional cooperation keeps moving forward in the spirit of innovation and exploration. As key participants and promoters of Asian regional cooperation, ASEAN and China should build on the sound momentum to deepen cooperation across the board. The first is to enhance strategic synergy and make proper top-level planning. The second is to nurture innovation highlights and tap cooperation potentials. The third is to intensify people-to-people exchanges to cement friendship between the peoples. The fourth is to deepen cross-regional cooperation to speed up regional integration. Participants actively made suggestions on topics including opportunities and challenges for Asian regional cooperation in the new situation and the coordinated development among regional cooperation organizations. Representatives from regional and sub-regional institutions such as the Council for Security Cooperation in the AsiaPacific (CSCAP) and the Mekong Institute (MI) participated in the discussions. 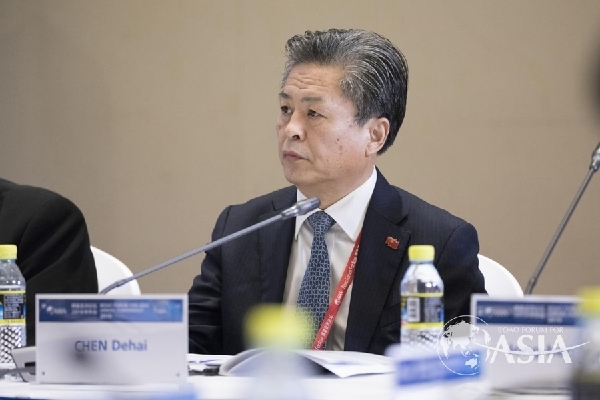 The Round-table on Asian Regional Cooperation Organizationsis one of the series activities of the BFA Annual Conference 2019 held in Boao, Hainan Province from 26 to 29 March, with the theme of “Shared Future, Concerted Action, Common Development”. More than 2,000 people including politicians, business representatives, think tank scholars and heads of international organizations from more than 60 countries and regions participated in the event. Secretary-General Chen Dehai also attended the opening ceremony of the BFA Annual Conference 2019 upon invitation.